New England Bulkhead started in as a home Improvement Specialist. We Have been installing custom steel cellar doors and precast steel cellar entrances since 2002. By remaining focused on the cellar entrance business, New England Bulkhead has become the authority on custom doors and leads the industry by providing the best fitting doors for each and every job. We just do Bulkheads and we do them right. "What We Do" is all we do... We do complete removal and dig out of the old single lift door with springs and lower steel stair units. We then install precast concrete stairs which are drilled and bolted thru the foundation with new double door units installed on top. with these old single lift door units depending on the condition of the lower portion we can also cut off the upper unit at the seam. replate the top edge and install new double door unit on top! Consulted on Bulkead replacement They came to my home with the intention of replacing the bulkeads. They looked at determined I did not need a new bulkead and instead instructed maintenance of the gutter system. I was very impressed. Big Dig Out Precast concrete. 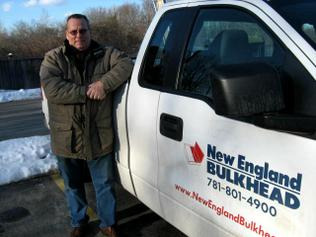 has been installing Cellar Doors in the Massachusetts area's since 2002.